This is just a quick card that I made for my aunty. The techniques in this are an attempt at marbled stains topped with shadow stamping. I think that the overall effect is really pretty…just right for my aunty. and I have added interest to the swirls with a white pen, which I also used to add dots amongst the swirls…like a starry effect. Pearls and swirls are always a classic combination! Really pretty card Dot. The background is stunning and the lovely image with black and white gives a striking effect. Such a fabulous card with everything just perfect Dot including the embellies, wink wink. I think both techniques worked really well, love the swirls, lovely card. Beautiful Card! Love how the stamping turned out, beautiful color! Thank you for joining us at Sugar Creek Hollow! A fantastic card, great image. Love the tiny butterflies. 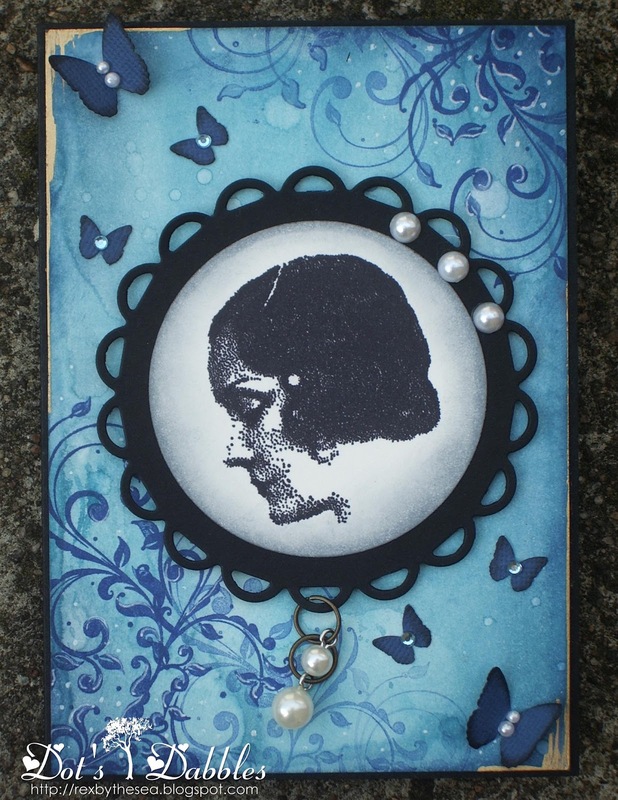 Classic and elegant Dot, I love the blues, the background is lovely and the framed image really pops. What a lovely card. I love the image & elegant design. Thanks for joining us at Divas By Design. Oh Dot, this is so beautiful, I love the image (I love to stamp people), and the background is absolutely gorgeous. It's very serene. What a beautiful card… love the techniques you have used and the image/flourishes are lovely. Thanks for joining us at the POODLES PARLOUR 'Monochromatic' Challenge. Good luck and hope to see you next time.